I would like to give you an update about my mare Mara that I treated with The Perfect Horse® from spring 2008 to the end of summer 2008 thanks to your gracious providence of the The Perfect Horse®. Mara foundered in the winter of 2007 and came to us in spring 2008. She was in poor body condition, her hair coat was dull, and she showed evidence of bilateral front limb laminitis (lameness grade 3/5). She would only walk slowly, and was very tender-footed. Her hooves showed horizontal rings diverging from each other, evidencing chronic laminitis. 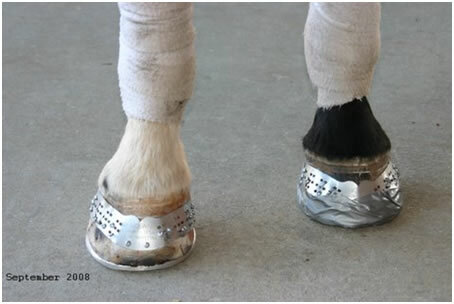 Nolan hoof plates were applied to both front feet since the onset of laminitis. The hoof quality was considered poor. Foot radiographs showed severe rotation of the coffin bone of the left front foot and moderate rotation of the right fore in April 2008. The sole thickness was 7 mm on the left foot, and 10 mm on the right foot, respectively. 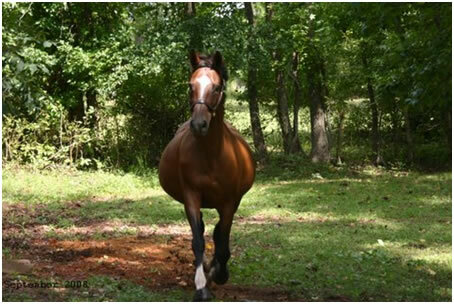 Mara was then supplemented with the raw food The Perfect Horse® starting at 1 ounce twice daily for 2 weeks, followed by 1 ounce once daily. The mare was kept on grass pasture. Her hoof growth was very good with at least 1 cm per month. The hoof horn quality also improved and the sole thickness increased significantly in approximately 2.5 month to 17 mm on the right fore. Unfortunately, the sole depth of the left foot remained the same. At the same time the mare’s comfort level (bilateral lameness grade 1 to2 /5) improved as well, as did her body condition and hair coat. Regular corrective shoeing, with the Nolan hoof plate, was performed by her farrier. Follow-up radiographs in September demonstrated similar findings, although the sole depth of the right fore was slightly less (14 mm) than in July. Nevertheless, the mare felt great and the lameness was resolved on soft ground. It was a great pleasure to see the mare cantering and showing a lovely elastic trot on the pasture. The supplement of the raw food The Perfect Horse® was given until August 2008 and it seems likely that the increasing sole depth and improvement of the horn quality was associated with the administration. This was further supported by evidence of worsening hoof quality, decreased horn growth, and deterioration of the left front foot (abscess formation and recurrence of lameness) since discontinuation of theThe Perfect Horse®. The right front foot is still sound, although the hoof growth and horn quality are significantly less despite a balanced diet. 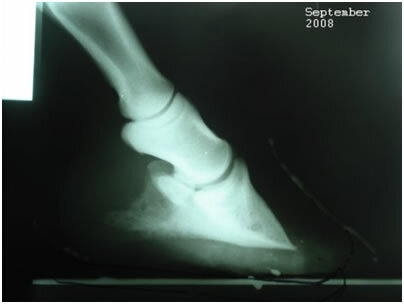 It appears that the corrective foot trimming with the Nolan plate as well as the supplementation with the raw food The Perfect Horse® supported the resolution of the laminitis in the right front foot. We did not know why the left front foot did not respond as well radiographically. Clinically, the mare was sound on the left fore during the late summer and early autumn months. Due to the convincing observations, I will initiate the raw foodThe Perfect Horse® supplementation again and hope for the same positive experience in the near future. Images of the front feet, including radiographs, and photos of the mare are added in a chronological order. Unfortunately, the photos of the feet do not do justice to the actual growth of the horn. The rings on the dorsal aspect of the hoofs demonstrate some of the new growth. Thank you so much for your support with Mara! It gave us an opportunity to observe the significant results, and I would highly recommendThe Perfect Horse® for horses suffering from laminitis or those with poor hoof quality. since the onset of laminitis. 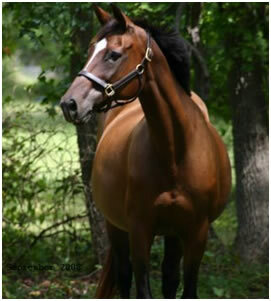 The mare’s comfort level (bilateral lameness grade 1 to2 /5) improved as well, as did her body condition and hair coat.